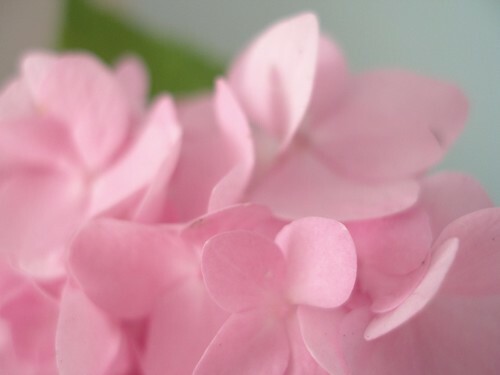 Pink Hydrangea, originally uploaded by the workroom. I’ve been meaning to cut some Hydrangea flowers from the garden and put them in my room. I finally cut a tiny bloom off this morning. I did a bit of research to find out the best way to make them last longer. I used the hot water method. I’m curious to see how long I can make the bloom last by repeating this on a daily basis. I’ll let you know. 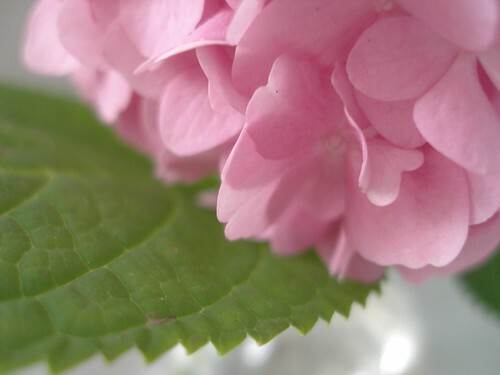 This particular Hydrangea blooms either pink or blue depending on the pH of your soil. My soil is obviously alkaline. I’m thinking about adding some coffee grounds or peat moss to try to get some blue blooms next year. I do have a real soft spot for pink though. Did you know that a specific shade of pink, Baker Miller Pink, has been found to lower your heart rate and is used in prison holding cells to calm down prisoners? your tip on soaking the hydrangea stem was so timely. I had to make 8 floral arrangements this past weekend for my parents 50th anniversary. I ran out of flowers for the last couple vases, so I had to raid my own garden for filler. I have never used hydrangeas in an arrangement before because they wilt so quickly, but just the day before I read your blog and learned the secret!!! The hydrangeas still look fresh and amazing 3 days later! (Now I wonder if the same trick would work for lilacs. jill – i love that some of the wacky, random things i talk about are actually useful to others. i’ve also had bad luck with lilacs, they don’t last at all… i just did some research and apparently smashing the woody stem with a hammer and then dipping them in hot water will help them last longer. let’s report back next spring and see if it works!